"The Bunker Hill Monument, stands in the center of Monument Square, on Breed's Hill, where the barricade was thrown up by the Americans on the night before the historic battle. It is 221 1/6 feet high, and 6,700 tons of granite was used in its construction. The monument is 30 feet square at the base, and gradually tapers to 15 2/5 feet at the apex. 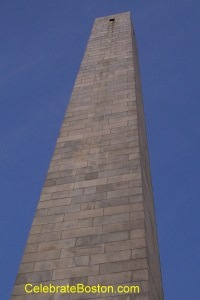 The obelisk is hollow, and contains a spiral flight of 295 stone steps ascending to a chamber 11 feet square and 17 feet high. There are four windows in the observatory, where a beautiful view can be obtained of the city. The stone at the apex, above the observatory, is one piece, and weighs 2-1/2 tons. On June 17, 1825, the cornerstone was laid by General Lafayette, with an oration given by Daniel Webster. The monument cost over $150,000, a huge sum at the time. It was dedicated June 17, 1843, on which occasion Daniel Webster was again the orator, and President Tyler and his cabinet were present. The monument commemorates the important Battle of Bunker Hill of June 17th, 1775. 4,000 British troops marched bravely up the hill, to almost certain death, and attacked the works hastily thrown up by the American [Provincial] troops the night before. The Americans numbered about 2,500, and were under the command of Colonel Prescott, General Putnam, and General Warren. 800 or so British were killed, with as many wounded or missing, in their repeated attempts to storm the works. 100 Americans were killed, with 340 wounded or missing. Just before the battle, Prescott gave the famous command "don't fire til you see the whites of their eyes," to delay firing and conserve precious gun powder. Lesser known heroes at Charlestown include Peter Salem., Salem Poor and Isaac Freeman, all African-Americans. Walking Directions: A very popular route to the Bunker Hill Monument and U.S.S. Constitution is via the Water Shuttle to Charlestown from Long Wharf (at the Marriott Hotel, a large brick structure). After debarking the boat in Charlestown, walk to the end of the dock and left to the Constitution Museum. Follow the Freedom Trail from there about 1/4 mile up the hill to the monument. The nearest MBTA stops are North Station and Community College on the Orange Line (15-20 minute walk).